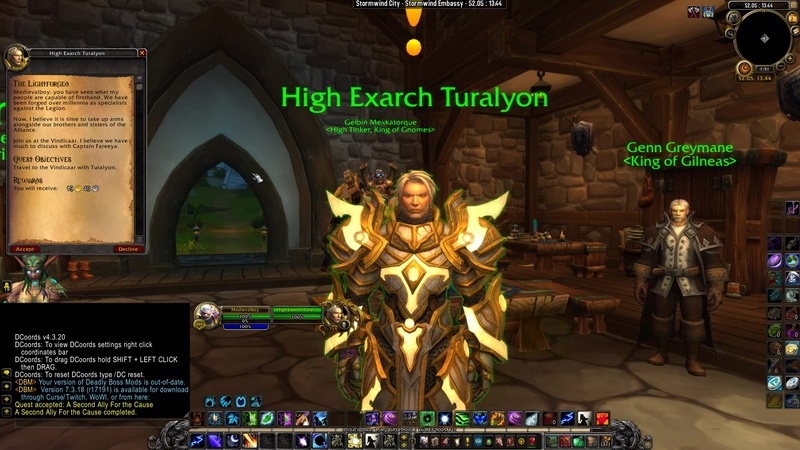 High Exarch Turalyon: (Name), you have seen what my people are capable of firsthand. We have been forged over millennia as specialists against the Legion. Now, I believe it is time to take up arms alongside our brothers and sisters of the Alliance. Join us at the Vindicaar. I believe we have much to discuss with Captain Fareeya. 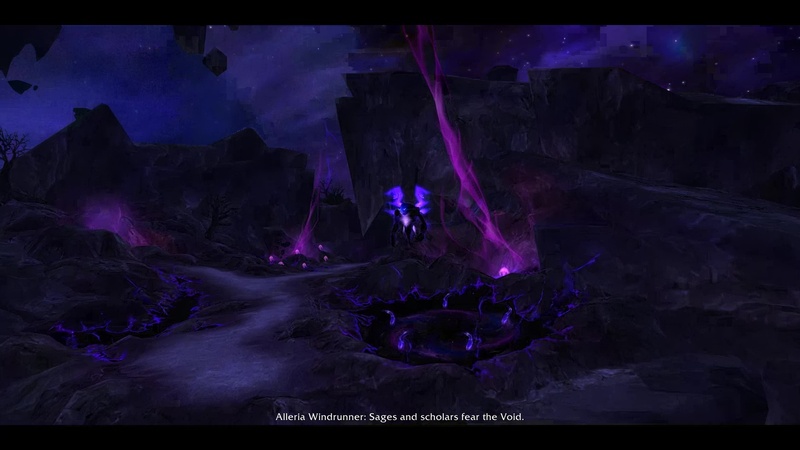 Travel to the Vindicaar with Turalyon. 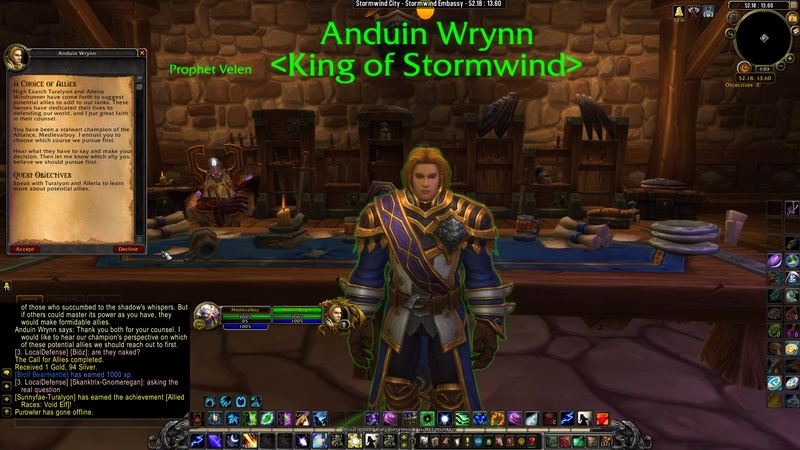 King Anduin Wrynn: You have taken an important first step in strengthening the Alliance, (Name). Well done. But I fear a single new ally will not deter the Horde. The warchief will not rest until Orgrimmar’s forces vastly outnumber the defenders of Stormwind. I must ask that you work to secure our next ally. We cannot afford any delay. Choose a second ally to pursue. 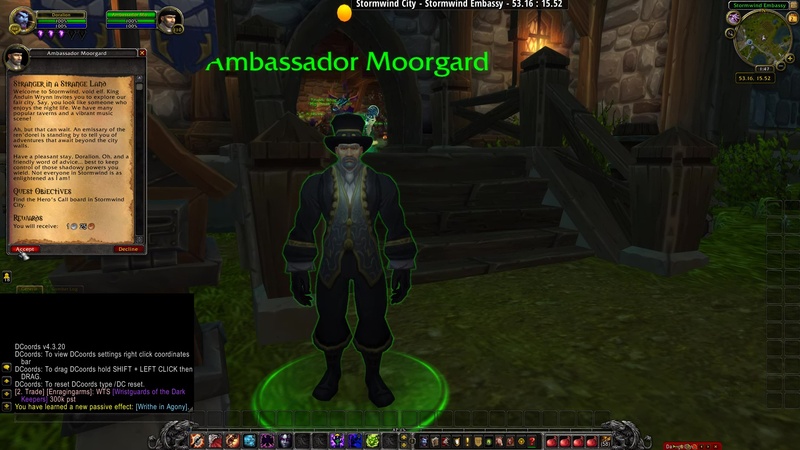 Ambassador Moorgard: Welcome to Stormwind, void elf. King Anduin Wrynn invites you to explore our fair city. Say, you look like someone who enjoys the night life. We have many popular taverns and a vibrant music scene! Ah, but that can wait. An emissary of the ren’dorei is standing by to tell you of adventures that await beyond the city walls. Have a pleasant stay, (Name). Oh, and a friendly word of advice… best to keep control of those shadowy powers you wield. Not everyone in Stormwind is as enlightened as I am! Find the Hero’s Call board in Stormwind City. 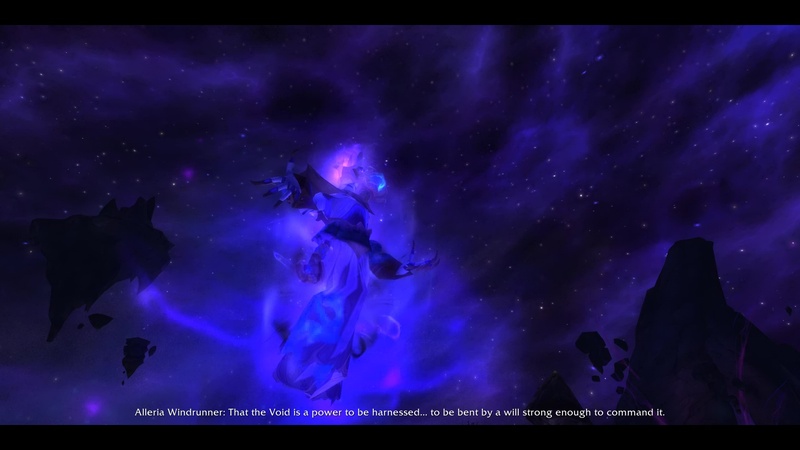 Alleria Windrunner: The Void. A force of infinite hunger. Its whispers have broken the will of dragons… and lured even the titans’ own children into madness. Sages and scholars fear the Void. But we understand a truth that they do not. That the Void is a power to be harnessed… to be bent by a will strong enough to command it. The Void has shaped us… changed us. But you will become its master. 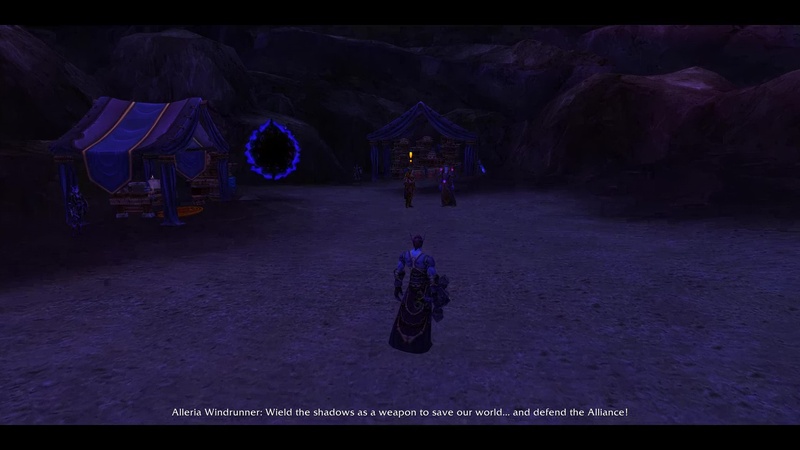 Wield the shadows as a weapon to save our world… and defend the Alliance! 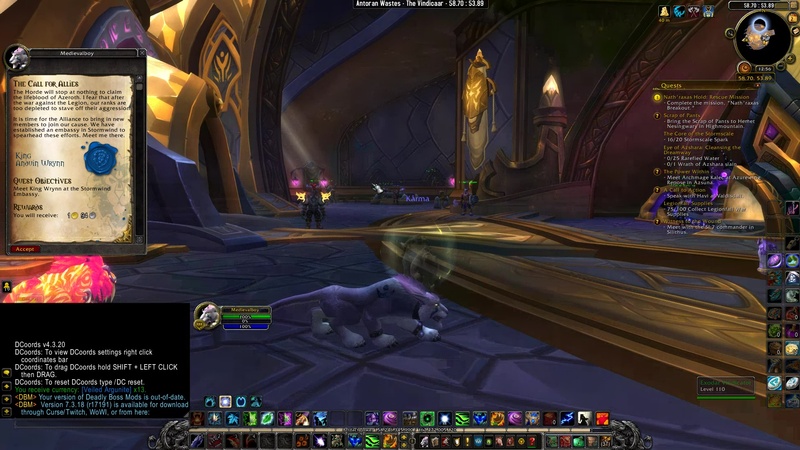 Alleria Windrunner: Mastering the whispers requires constant focus and discipline. 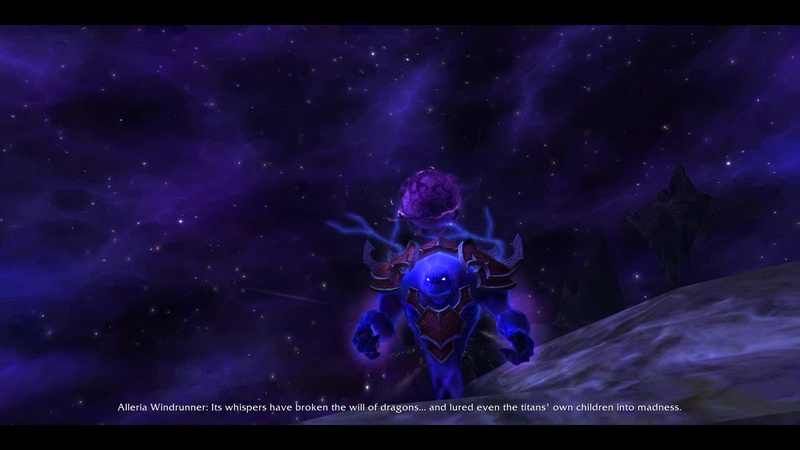 Your dedication inspires all who bear the name ren’dorei– for we have become children of the Void. You have learned many lessons here, but the time has come to venture beyond Telogrus Rift. Go to Stormwind, the heart of the Alliance. There, the king’s ambassador will greet you and guide you along your journey. Azeroth must be defended. I can think of no one better suited to answer that call than you, (Name). Alleria Windrunner: A blood elf called Umbric and his followers were banished from Silvermoon City for the exploration of void magic. An extreme solution despite the practice being forbidden. However, it opens up possibilities for the Alliance. If we can find these outcasts, we might be able to recruit them to our cause and–even more importantly–help them understand the void before it corrupts them. 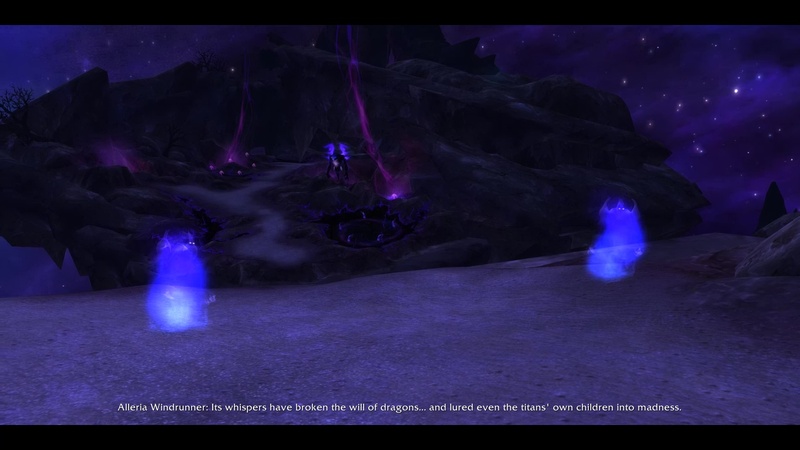 Locate Umbric’s home in the Ghostlands. 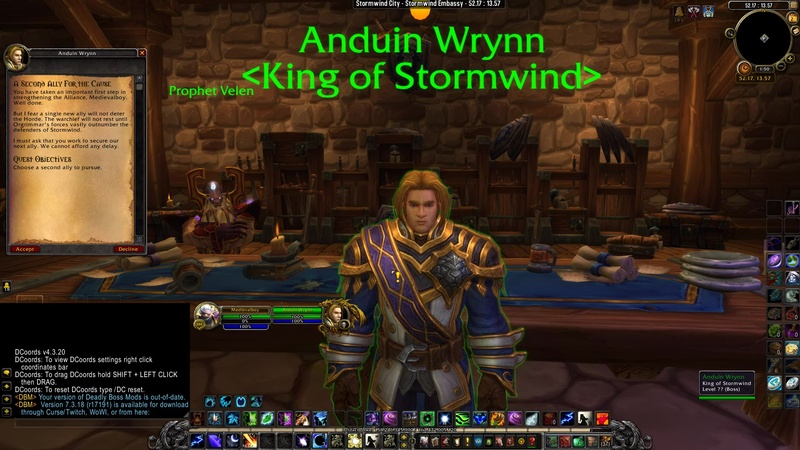 King Anduin Wrynn: High Exarch Turalyon and Alleria Windrunner have come forth to suggest potential allies to add to our ranks. These heroes have dedicated their lives to defending our world, and I put great faith in their counsel. You have been a stalwart champion of the Alliance, . I entrust you to choose which course we pursue first. Hear what they have to say and make your decision. Then let me know which ally you believe we should pursue first. 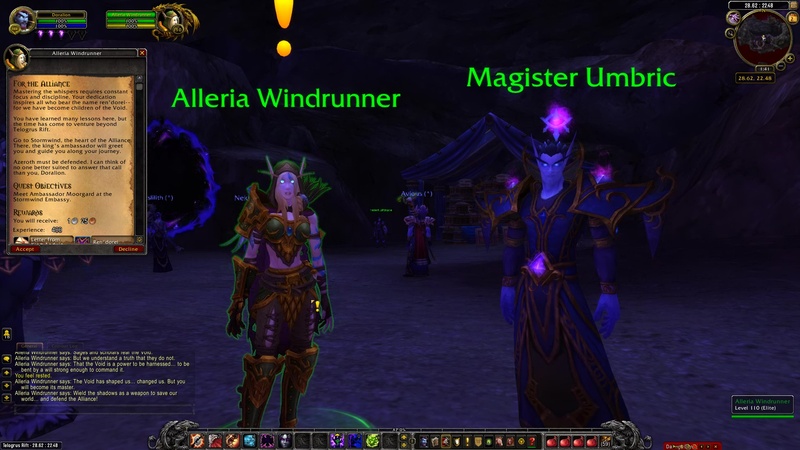 Speak with Turalyon and Alleria to learn more about potential allies. King Anduin Wrynn: The Horde will stop at nothing to claim the lifeblood of Azeroth. I fear that after the war against the Legion, our ranks are too depleted to stave off their aggression. It is time for the Alliance to bring in new members to join our cause. We have established an embassy in Stormwind to spearhead these efforts. Meet me there. Meet King Wrynn at the Stormwind Embassy. 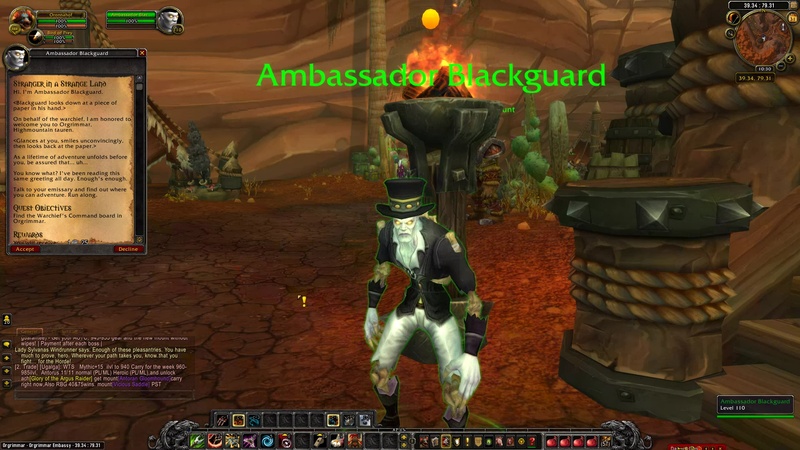 Ambassador Blackguard: Hi. I’m Ambassador Blackguard. (Blackguard looks down at a piece of paper in his hand.) On behalf of the warchief, I am honored to welcome you to Orgrimmar, (race). (Glances at you, smiles unconvincingly, then looks back at the paper.) As a lifetime of adventure unfolds before you, be assured that… uh… You know what? I’ve been reading this same greeting all day. Enough’s enough. Talk to your emissary and find out where you can adventure. Run along. Find the Warchief’s Command board in Orgrimmar. 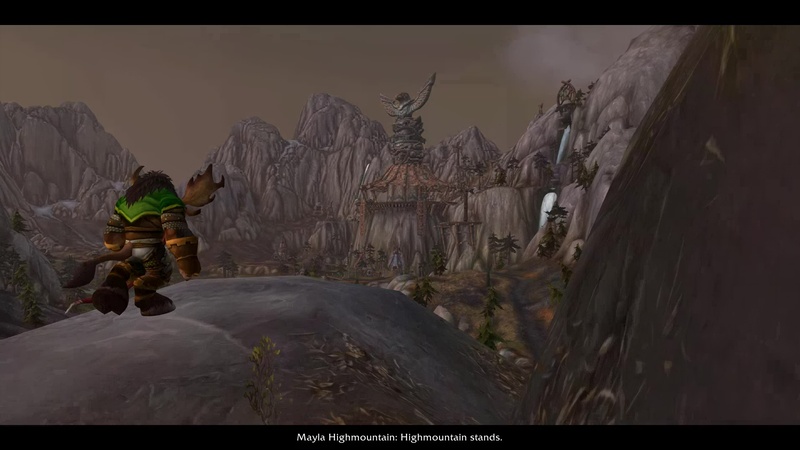 Mayla Highmountain: Highmountain stands. These words speak of more than earth and stone. They tell the history of our people, enduring hardship and conflict to unite against common foes. The time has come for you to venture beyond our sacred peaks. 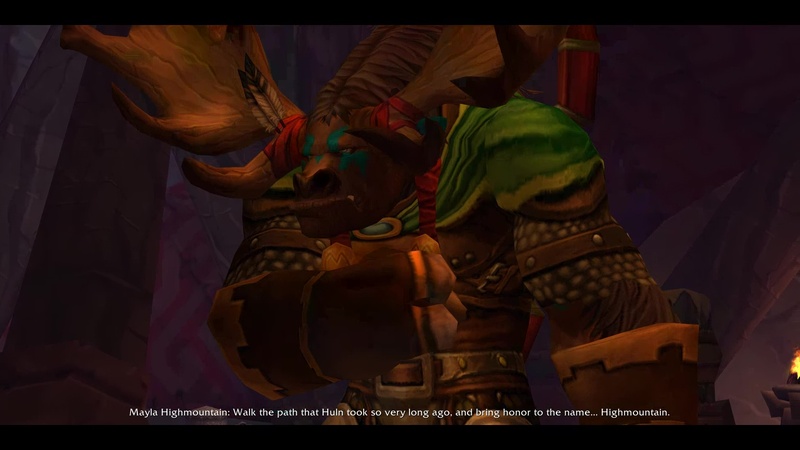 Walk the path that Huln took so very long ago, and bring honor to the name… Highmountain. 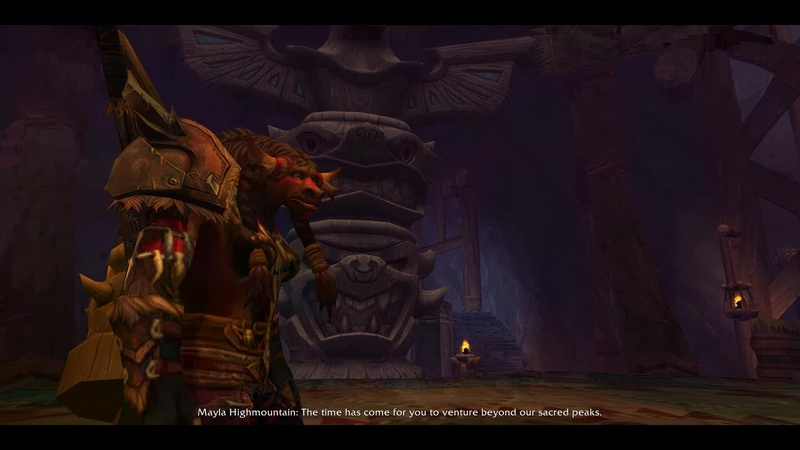 Mayla Highmountain: A new age dawns upon Highmountain, (Name). After centuries apart, the bond with our kin from Kalimdor has been reforged. And in the fight to save our land, we found new friends among the people of the Horde. 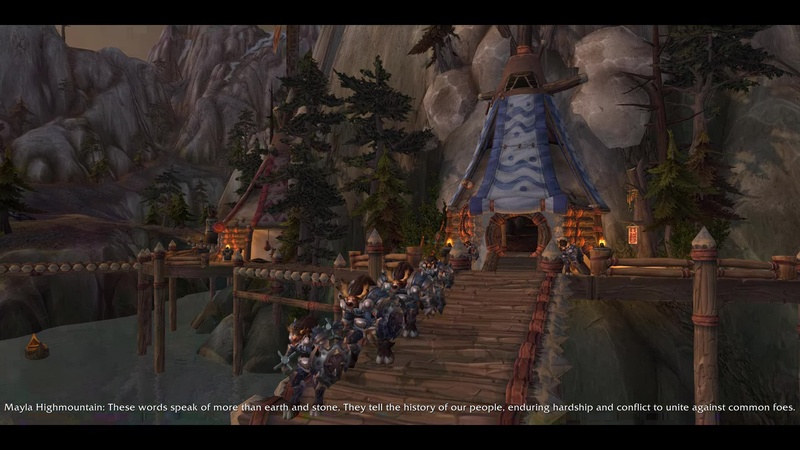 To show the strength we bring to our allies, brave tauren like you must heed the call of adventure. You have been invited to Orgrimmar. Meet with the ambassador at the warchief’s embassy, then begin your journey across Azeroth. Earthmother be with you, (Name). 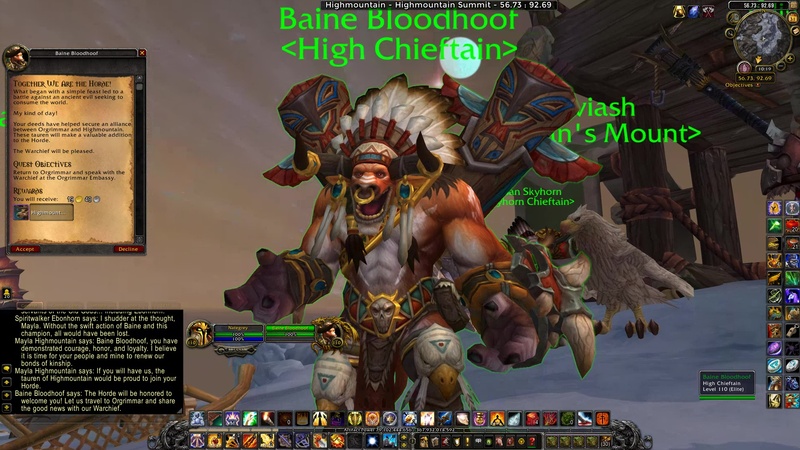 Baine Bloodhoof: What began with a simple feast led to a battle against an ancient evil seeking to consume the world. My kind of day! Your deeds have helped secure an alliance between Orgrimmar and Highmountain. 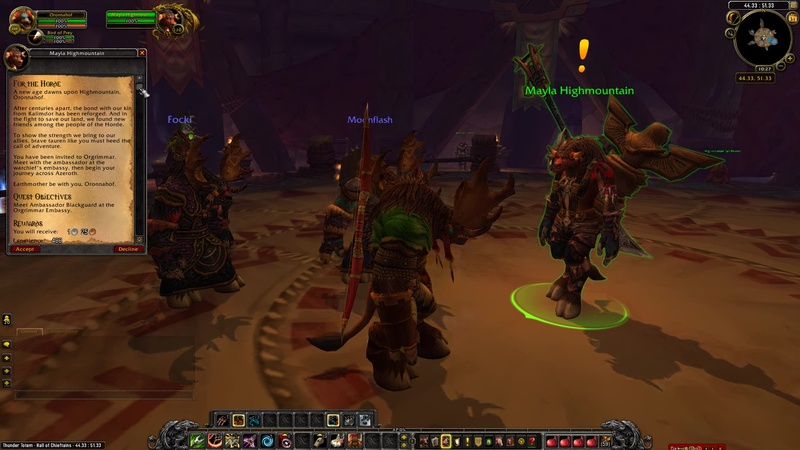 These tauren will make a valuable addition to the Horde. The Warchief will be pleased.